Charles Lynch has no time for you, small buildings. When looking through back issues of Journal and the Citizen for evidence about the construction of apartment buildings, it feels like more buildings were opened to greater fanfare than they were during the 1950s later. 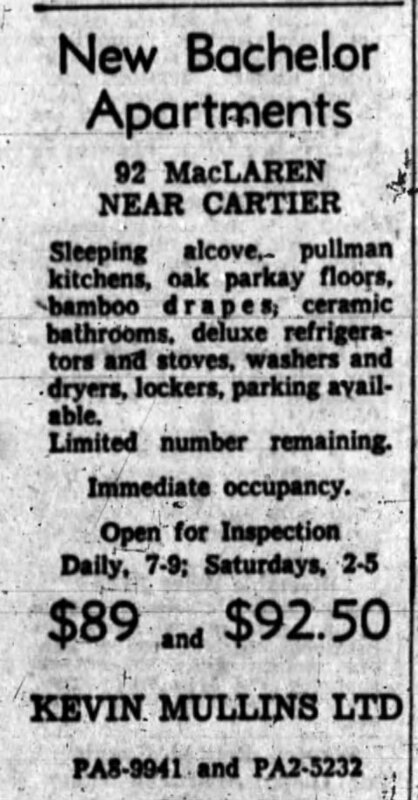 Of course, when you’re in an era where 12+ storey buildings were erected regularly, a small three-floor walk-up is unlikely to warrant much more than a larger-than-normal ad in the Classified section. As a result, these smaller modernist walk-ups tend to be lent a certain unassuming or anonymous character that the towers were not. My own casual (untested) observation is that they were as likely to be unnamed as named and the ads name no landlord or company. In an era when towers were popping up, they often escaped mention in the weekly real estate section. As the federal bureaucracy continued to grow into the 1960s and 1970s and, more importantly, further professionalize, a new class of civil servant came to need accommodation in Centretown. No matter which way you slice it, bachelor apartments have not normally been popular for raising a family. Builders of apartments in Centretown, however, identified the trend of the unmarried young professional. 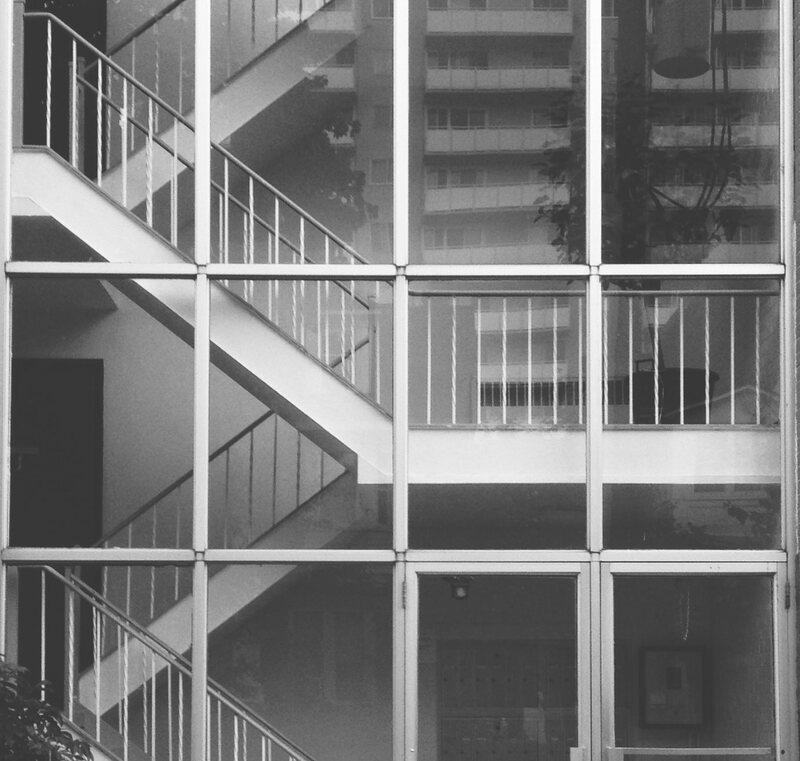 During the late 1950s, builders began to construct buildings that consisted entirely of bachelor units. The building that I currently live in is an example (I’ll be writing about that one soon) and 92 MacLaren is another one. Unfortunately, I have been unable locate the designer or the owner of the building. When it was constructed, the owner hired Kevin Mullins, a local real estate agent to fill it. The units were rented out for what appears to be the going rate for a bachelor unit at $89 – $92.50 a month. Although there were indeed a number of landlords who advertised that their bachelors were suitable for two people, others were certain to advertise them as Single Occupancy. Miss Diane Chevrette, a vivacious receptionist with the Department of National Defence’s administration branch, was crowned RA Queen of the Year at last night’s annual RA Revue. The 23-year-old blue-eyed blonde smiled, posed and walked her way to the top honours during a competition that had the judges chewing their pencils for three and one-half hours. She is the daughter of Judge Armand Chevrette and Mrs. Chevrette of Montreal and has been in the Civil Service since January. She lives at 92 MacLaren street. A tie among the three finalists delayed the final decision 15 minutes and caused one revue official to remark that it was the “closest contest on record”. 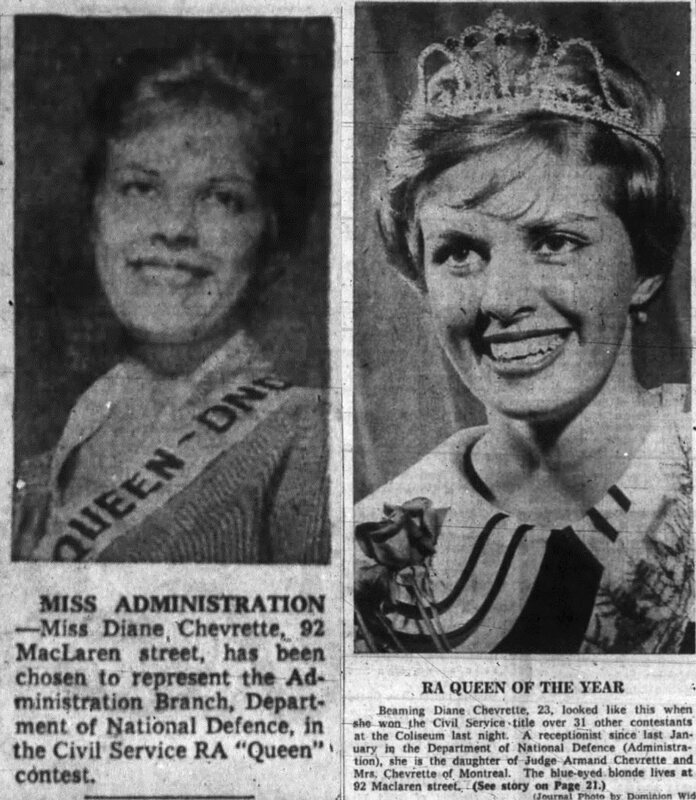 Runners-up were Miss Myrna Hunter, 21, of Victoria, British Columbia (Miss Defence Research Board), and Miss Margaret Brant, 18, of the Mohawk Indian Reservation near Belleville (Miss Department of Indian Affairs). Miss Chevrette, who tips the scales at a dainty 125 pounds, stands five feet, seven inches in her stocking feet. She was named queen after treading the boards with 31 other civil service hopefuls. 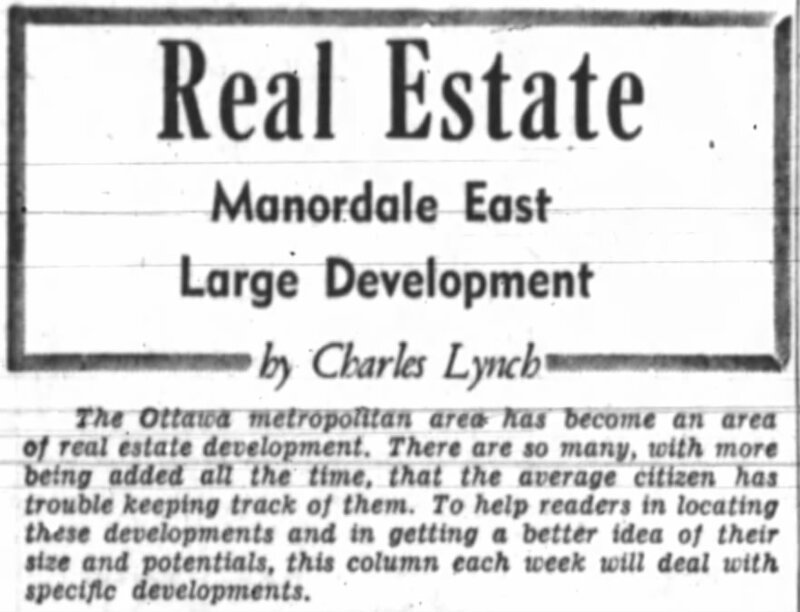 – Ottawa Journal, May 10, 1960, Page 21. Miss Chevrette’s victories were both reported. Another young woman resident at 92 MacLaren made the news for a different reason a few years later, in 1966. That winter, the “Traffic Fixing Case” was followed by the Journal whereby a Mrs. Helene Harrison was accused of being paid to remove “traffic offence reports from police files.” One of the star witnesses was a Miss Elaine Joss, resident of 92 MacLaren, and personal friend to Mrs. Harrison. Not only did the accused officer, Leo Provost, resign as things got hot, but Miss Joss was also later fired from the police department for failing to uphold her statement against him as the investigation continued. In the end, Harrison was acquitted. Kevin Mullins, the real estate agent who was hired in 1959 to fill the units at 92 MacLaren enjoyed what seems to have been something of a successful career in real estate. His name showed up frequently in advertisements and he seems to have been mostly involved in the sale of detached and semi detached housing from Manor Park to the west end. He did, however, seem to develop a certain sympathy for – and rapport with – the owners of apartment buildings. Kevin Mullins isn’t a household name. But in the small world of land developers and municipal taxmen the 43-year-old real estate consultant cuts a wide swath. His one-man campaign to get justice for hard-pressed apartment owners and tenants culminated Thursday in the Ontario Municipal Board decision ordering Nepean Township to repay $1.25 million in taxes to Minto Construction Company Limited. Befitting a rugged individualist who isn’t afraid to fight bureaucracies, Mr. Mullins is paid wel[sic] to take the risks. Hiss[sic] fee is 50 per cent of the first-year tax savings of his clients. A specialist in representing property owners facing expropriation, Mr. Mullins likes to operate independently of governments and prefers to negotiate rather than fight. But on once case he felt he was brushed off by the assessment department. He became angry and took the city to court. – Ottawa Citizen, August 25, 1972, Page 4. So the legend was born. During the late 1970s, when the property tax system was in flux, Mullins was retained by a number of landlords to fight the changes. During this time, it appears that there was a switch to the full property value system (that I believe we are under now) and the rate charged to high rise apartments was, in some cases, more than twice the rate paid by small apartments, owner-occupied dwellings, commercial, and industrial rates. It had long been Mullins’ mission to see that a unit-was-a-unit-was-a-unit and that all properties were assessed at an equal rate. In addition to that, it had been only three years since Ontario had introduced its rent control regime and large apartment-owners felt additionally hard-done-by. Unfortunately from there, I am uncertain what the outcome of Mullins’ efforts were as – if I remember correctly – apartment buildings are still assessed at a different rate are detached homes.